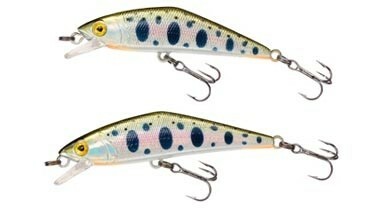 Smith D-Contact Type2 minnow baits are the innovative trout minnows, to be used in white rivers. The Type2 body has heavier weight of 5g for 50mm instead of 4.5g of regular models. Weight is balanced to let the bait sink at level. The weight allows you to cast long, and to land them like arrow below the bush and leaves. The heavy body makes inertia sliding actions at twitching. Its flat body sides reflect light to attract trout hiding under rocks. The well designed lip keeps steady tight wobbling actions even at fast retrieving. The wobbling action of this bait is subtle, but quite effective to natural trout. Jun's comment: Smith D-Contact 50 is now considered the best trout bait in natural rivers in Japan. Since its debut in around 2007, D-contact has totally changed the trout fishing in rivers, and ousted many other baits out of tackle box of trout anglers, like spoons, spinners, balsa minnows and etc. Heavy weight minnow casts long, fast in checking fish, and quick to catch fish. Please try this bait and see why many Japanese anglers love this. There are a few similar heavy weight minnows and please try them as well.